To start, let’s review some high school chemistry. We were taught that the atom is an extremely small particle, consisting of protons, electrons, and neutrons. The nucleus of the atom is the center around which the negatively charged electrons rotate. The nucleus is comprised of neutrons (neutral charge) and protons (positive charge). The varying number of protons, electrons and neutrons creates the diverse group of naturally constructed elements. The elements can also combine with other elements by either sharing electrons or transferring electrons. This is called a chemical bond. For our purposes, we will consider 2 elements, carbon and hydrogen. These elements bond through sharing electrons, also called a covalent bond, to form a compound. 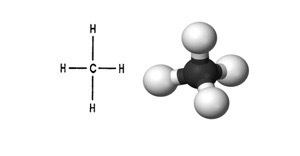 The simplest compound is methane, CH4 (4 hydrogens and 1 carbon). A polymer is formed when a string of carbon and hydrogen atoms come together. The more carbons in the string, the longer the chain. These chains can either be straight or branched. By taking a string of carbon atoms, we are able to develop many different products, including Green Ice Wax. The longer the chain (the more carbon atoms present), the higher the temperature is needed to melt the wax. Straights chains tend to be more flexible and soft, while branched chains tend to be more rigid and hard. Since the goal of a good wax is to match the hardness of the snow with the hardness of the wax, a formulator must mix various chain lengths and shapes to arrive at a final product with a particular hardness. More complex waxes tend to use additives to help reduce friction and repel water. The most popular additive is fluorocarbon. Here, fluorine (F) replaces some of the hydrogen in the polymer. Fluorocarbons have been determined unsafe and not eco-friendly. Green Ice 1000 and 2000 uses a different, but effective additive which makes it safe to apply and safer for the environment.